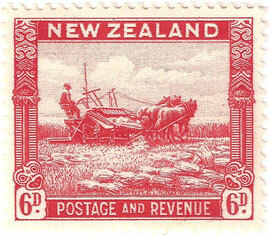 6d Harvesting - New Zealand Stamps, A 1935 Pictorial overview. 6d. Harvest, this agricultural scene shows two horses pulling a reaper and binder to harvest a crop of wheat or oats. This was the only design accepted from a overseas designer, T. I Archer from India.